This year has been a little experiment to see what vegetables I can grow in my very small garden, and what I can manage to grow in pots and bags. I have discovered I cannot grow rhubarb for love nor money, and my spinach got eaten before it came to anything. I have three tubs of strawberries that have produced no more than half a dozen very small fruit. And my tomatoes, both in the garden and in tubs, have grown into huge bushes with lots of flowers, but no sign of any fruit - I am hoping that we have a sunny Autumn to encourage them to come on. I have one pot growing a courgette plant and that is doing really well with lots of fruit- I would need to grow another two or three pots to get a decent number of courgettes, which I will do next year. My potatoes in bags are shooting up all over the place, so I am hoping for a good yield from them. 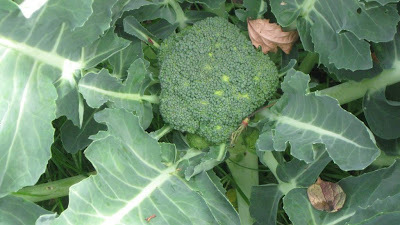 My major success has been the broccoli that I have planted into between flower plants - they have taken over what little garden I have, and it looks like I will get a crop that will keep my husband and I going for quite a few weeks. 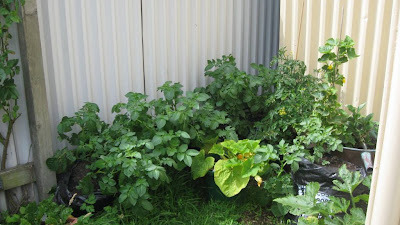 It has been an expensive exercise growing vegetables in pots, by the time I bought soil, compost, pots and so on. No doubt it would have been much cheaper to go to the farmers' market every Saturday and get my vegetable supplies there. 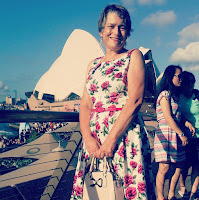 However, it has been great fun watching the plants grow, and I am a bit like Prince Charles......I go out and talk to the plants every evening and tell them how beautiful they are...to try to encourage them to grow more....my kids think I am turning into a dotty old woman! What do you find grows well in pots, and what should be kept in the garden? Rhubarb does not like living in pot. From experience, it likes a well manured partially shaded area. Make sure that it is not planted too shallow. It likes to have its roots damp. Brocoli: make sure you rinse them well in vinegary water before you cook them, otherwise you might end up with extra organic proteins, AKA caterpillars. Did you see any white butterflies around, or is it too cold down your way? From the picture they look really good and the leaves do not appear to have been touched by caterpillars. Strawberry in pots need a lot of water and regular fertiliser. Compost is expensive but you can produce quite a lot by using un-cooked veg cutting form the home, cut grasses (and if it turns too soggy add straw). If you grow comfrey (not in a pot! ), you can had the leaves to the compost. Wonderful plant. Have you tried to hypnotise the veggies to make them grow faster? For the tomatoes, you might need to try hand-pollination if there are not enough bees around. I find that planting flowers in the middle of the vegetables tends to attract pollinating insects. Too cold for bees down your way? 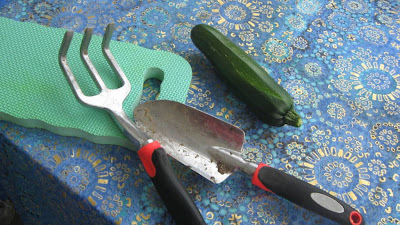 Hopefully your garden is organic. MOstly now a days the gardens are full of this fertilizers. Hi Herve, thanks so much for your replies which were really useful. The rhubarb is in the garden - I have some horse manure which I'll put around it to see it that helps. I have a compost bin & use that - I used a lot of compost this year to grow my potatoes, but at least could get it at a reasonable price from The Warehouse. As for bees, I have had some tomatoes by a lavender bush so they should have been visited by bees. I was told that our terrible December had affected the veggie season this year - now we're getting nice weather, I hope things will pick up. Jobs: Good point about organic fertilizer etc - it is not soemthing I have thought about much. But we had a TV program on last night about how to make organic pest spray, so will look into it a little more.